The Majestic property was originally the site of the Hiram Whittington House in 1870. The Avenue Hotel was the first name given to the hotel, built in 1882, featuring an electric dining room and gas powered guest rooms. Street cars arrived and departed every five minutes to transport guests to and from the bath houses. She was renamed the Majestic Hotel in 1888 and was named after the Majestic Stove Company although no one really knows why. Perhaps someone there had interest in the company or just simply liked the name. The newly named hotel featured a brand new invention, the elevator. In 1902, owner Harry A. Jones demolished the old wooden structure and replaced it with a five-story yellow brick building. She reopened a short time later in 1903 with a fully equipped greenhouse, distinctive bull’s-eye windows and rounded brick corners. 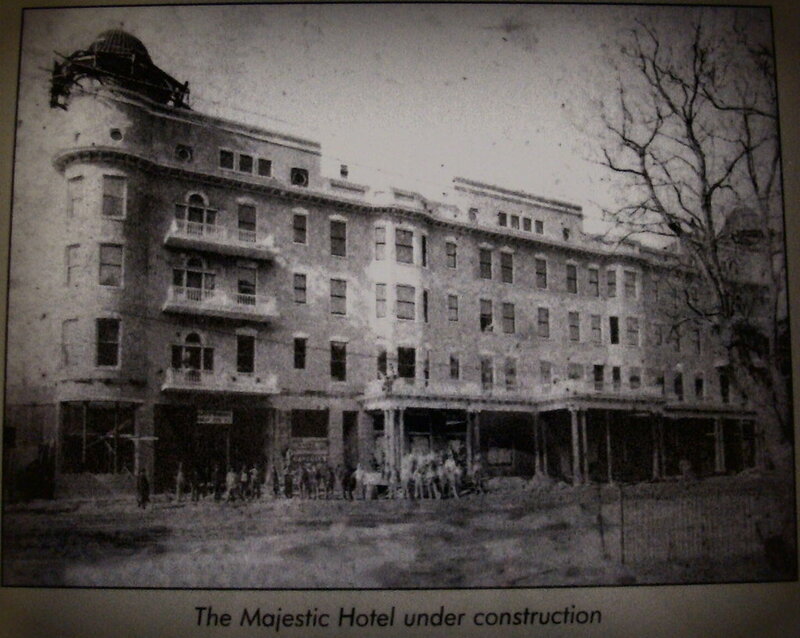 The Majestic Hotel was one of the first brick buildings in Hot Springs, featuring 150 rooms, 50 of those with private baths. This was also the grand opening of the famous restaurant known as The Dutch Treat Grill. A non-operational windmill hung over the restaurant’s front doors while window boxes full of fresh flowers wrapped her in beauty. h Pirates during spring baseball training from 1901 to 1916 and then again from 1920 to 1923. Babe Ruth reportedly considered The Majestic hotel his favorite place to stay. The Majestic was also frequented by the Boston Red Sox and in the 1920’s Bugs Moran, known Al Capone rival, arrived for respite. The two held a “peace pact” while in Hot Springs and reportedly never scuffled while in town. In 1926 the Annex was added, featuring local A.W. Griffee’s flint faience, marble and stone fountain in the spacious, wood-adorned lobby. The fountain bubbled with the world famous natural spring waters. This is the still-standing; eight-story, red brick building that later housed The Grady Manning Dining Room, named for the new owner in 1929. His company, Southwest Hotels, renovated the structure adding a front porch, drug store, new bath house and a brick terrace. The Annex also housed the soda fountain, a gift shop, a beauty parlor and garage/gas station just adjacent to the hotel. These renovations helped the hotel to survive The Great Depression and Stock Market Crash of ‘29. In 1932, Grady Manning constructed The Majestic Lodge on Lake Hamilton the year it came to be. She boasted a beautifully decorated lobby with an incredible view of the new lake. Radio Station, KTHS, owned a tower atop the Majestic Hotel and featured wonderful music including that of the “Southerners Orchestra”, complete with a banjo picker. The stations call letters stood for, “Kome To Hot Springs”. Directly across from the red brick Annex was the aforementioned Majestic Parking Garage at the corners of Arbor Street and Park Avenue. She was lovely with her white modern columns and signage reading, “Storage, Oil Changes, Parking”. She once housed the famous Clydesdale horses during the wedding of August A. Busch, founder of Busch-Budweiser beer. He was married in the lobby of The Annex building. In 1944, as their contribution to the war effort, the hotel offered her service as a redistribution center for the US Army for approximately 18 months. GIs were housed in the hotel upon return from overseas as they awaited reassignment or discharge. On December 15, 1945, the hotel reopened and this grand opening was attended by famous actor, Alan Ladd, known for his television show, “Candid Camera”. Phyllis Diller, Guy Lombardo, Hubert Humphrey, Liberace and Tiny Tim also stayed at the Majestic. Air conditioning was added to the hotel and all guest rooms in 1950. Highway 70 East was completed this year and moved traffic off of Park Avenue. This hurt the hotel immensely. Despite the highway and subsequent decline in use, the hotel added the Lanai Suites in 1958. The suites surrounded a waterfall and pools that were frequented by a scantily clad, Phyllis Diller, who drew quite a crowd in her bikini. The suites boasted the first of the modern sliding glass doors. In 1963, the 10-story Lanai Towers were added and was home of the famous “glass elevator” and two level parking garage. A major $1 million renovation took place in 1982 and was completed in October 1983. This was under the new president of Southwest Hotels, Monty Scott. The hotel, towers and suites all overlooked picturesque downtown Hot Springs and “the Crystal Fountain”. On windy days, one could touch the mist and sprinkles from that lovely lighted anchor of downtown. 130 rooms of the original yellow brick building were closed due to continued decline in occupancy in 1988. In 1989, The Arlington and Majestic Hotels were combined and in 1990, The Majestic Hotel was home to five permanent residents. Five years later, in 1995, the original yellow brick structure was renovated. Despite this effort, occupancy rates continued to sink. On October 13, 2006, Monty Scott, president of Southwest Hotels and owner of both The Arlington and Majestic Hotels, announced the closure of The Majestic. She was donated to Ark of Arkansas (a non-profit organization) in 2007 with plans to renovate and create affordable housing but the plans never materialized. On May 23, 2010, fire completely destroyed the Majestic Lodge on Lake Hamilton. The beautiful, historic Majestic Hotel sat empty and forgotten until her sale to Gary Hassenflu of Garrison Properties, LLC, in January 2012. He announced plans to create retail space and apartments with the hotel property. On an unseasonably warm evening in February this year, fire robbed us of our historic treasure. February 27th, just days after the front page of the Hot Springs Sentinel Record displayed pictures of city workers boarding up her broken and vandalized windows, she was gone. Engulfed by flames that required 22 hours and as many as 75 men to extinguish her, she fell to a heap of rubble. Tears fell and hearts ached as lifetime residents and visitors alike watched the cruel fate of a neglected treasure. She’s gone but not forgotten. Her loss has ignited a fire of frenzy in the young and the old. Residents and many nationwide supporters have united to save this city. We will prevail! The loss of part of this great giant has a silver lining that will forever remain in the history of the revitalization of downtown Hot Springs! THIS OLD HOTEL IS PRIVATELY OWNED AND IS GUARDED 24/7! DO NOT GO ON THIS PROPERTY UNLESS YOU HAVE PERMISSION!! Hot Springs was wrong to demolish this beauty! I read a lot of reviews and feedback of how great this hotel was. I only I have money i'll buy this and renovate and install spa inside. This is very spacious. That is a shame. A huge piece of history destroyed. They don't make them like they used to. I passed through here earlier this week and this is the second time I've been to Hot Springs since this location's demolition. I've never even lived in Hot Springs, yet I was surprised at how sad I felt standing in that gaping hole where this proud building once stood. It doesn't feel the same down there anymore. Both times I've spent at least an hour wandering the property marveling at how such a larger-than-life structure (Majestic was the perfect name) could have taken up such a small chunk of land. It seemed so huge that I thought the site itself was as massive as the hotel, but it's really not. This is perhaps the saddest demolition event I've ever had the displeasure of knowing – even more so than the locations that were local to me in Texas. I'm sure it was at a great price too! Complimentary breakfast was great (Asbestos Muffins and Moldy Bacon) Mmmmm! Oh, seeing the news about the fire just makes me sick. My husband and I spent our honeymoon there in 2003, and while it was in desperate need of updates then, we loved its charm. The woodworking and tile in the lobby were simply beautiful, and I could only imagine what the soda shop was like in its heyday. We loved the breakfast room with its white tablecloths. We were able to use the bathhouse, as well, and it reminded me of something you'd see in movies about WWII. I am so devastated to see that the old beauty burned down. I was really hoping it would be updated like the historic Skirvin in Oklahoma City was, though that hotel was shuttered for many years before it was overhauled. What a terrible shame to see the Majestic come to this. I remember mi grandparents going there often and i made few trips with them it was kinda spooky in its own way yet amazing there was a place for icecream and dancing at night down the street was auction housrs.i remember you could walk out the hotel onto the mountain play shuffle board.go swimming .i really enjoyed it.i recently was thinking of the past and decided to go and when i looked it up to find out it was abandoned was a bit heartbreaking..but i have pictures by the pool and old postcatds from the hotel ill treasure always. Did you mean Allen Funt in reference to "Candid Camera" instead of Alan Ladd? After wasting almost an hour on internet I was surprised about the facilities and services they were providing in their premises at Kiawah Island Getaways. Splendid!! This hotel describe the some traditional stories which is quite good for the people. Let's see what we have more in these hotels. I recall it as huge, with lots of thickly carpeted corridors. The rooms weren't luxurious, but they were perfectly acceptable. The common areas showed some wear and tear. I would describe it as a 'fading glory' type of place. I stayed in the Majestic many many times as a child, but haven't been there for more than 10 years – it certainly wasn't part of the Barcelo chain last time I was there (I think it used to be Forte). My husband & I spent our honeymoon there in October 1987. It broke my heart to see the hotel go down in flames on the news. We will always have a special place in our hearts for The Majestic. I wandered in here with a friend a few days ago. We made it to the top floor. The place is a total wreck, but it was fun to climb to the top of the building and see everything. It's a shame that the hotel went down in flames. It will have it's own special place in history. This post was not only helpful with the comment issue, but had also great links to other entertaining blogs. Some of them I will most likely keep visiting!. I get lot of idea from your website. Thanks. Paris Flat list is website which provides you the great service. We are waiting for you to serve for comfortably journey. We are ready to help you find hotel and flat. Please visit our website Paris apartments rent Again thanks. I attended a well-attended presentation today at the Garland County Library. The meeting was organized by Liz Robbins, Director of the Garland County Historical Society and was given by Connie and Larry Jackson of Hot Springs on the History of The Majestic Hotel. My dad was the last manager of this hotel. His name is on a plaque in your pictures. I had a to of fond memories. He said as long as he ran this place it would never close. About a year after was gone they closed it. Hi there, I became intrigued with getting pictures of the majestic façade over the past 2 Christmases visiting Hot Springs. I probably have 75 pictures from various vantage points up and down Central Avenue, from other buildings downtown including the Weir Building, the Medical Arts building and from behind the Springs downtown hotel and from all over Hot Springs and West Mountain. I only obsessed over the sign at the top of the taller, middle structure but I have some pretty remarkable pictures. It became more imperative for me this Christmas as I saw the building being demolished when I arrived a week ago. I seriously love your site.. Pleasant colors & theme. Love the photography too! Did you make this website yourself? These places look so scary to get in to. Please reply back as I’m hoping to create my own personal blog and would like to learn where you got this from or just what the theme is called. Thank you! I can't believe that is so beautiful and abandoned. I would love to live there. Alan Ladd was a Movie ans TV star Alan Funt is the one who did Canied Camera. I was there for a wedding, the rooms were beautiful. There is so much history. All the major league players that stayed there during spring training. Why is that the Arlington can make it? Hot Springs needs to be ashamed to let this beautiful place just rot. Rebuild and promote its history. I worked at the Majestic Hotel for 23 years. With the closing of the hotel I even wrote a poem about the Majestic. She was a grand hotel with her wings wide open to receive the many visitors who came to stay. She had her ghosts who roamed the halls at night. It is a shame that no one would buy her and fix her. She also had Donna Mills, Conway Twitty, and Leon Spinks. Plus she had a a Movie made there with Randy Travis. The Movie was called the White River Kid. The Majestic used to have pool parties with the band George Gray. George Gray actually taught Bill Clinton how to play the Saxaphone. The history of the Majestic is so outstanding that some one should want her. They could HAVE saved this beauty if they had it registered as a historical marker, but leave it to the people WE voted into office to not allow that to happen. It may have a historical marker, but they could have RESTORED it and used as a M– — USEUM to repay the restoration fees, but their already huge pocketbooks didn't want to give up the extra pay that went into their pockets. What a shame!!!! Loved the photography here. It's very inviting and intriguing. Owners, please contact me before tear down! I am interested in salvaging old wood. Please don't let it be torn down before you allow me to pick a few special pieces! Please, please, please at least let me tour the Majestic before tear down. CONTACT ME!!! That was such a beautiful hotel it's just so sad to see it die like that. So sorry to see the shape this beautiful old gal was in when she caught fire on Feb. 27th, 2014. A sad ending indeed. I'm very thankful to Abandoned Arkansas. I think the events of yesterday and today show why sites like this one are so important. My grandparents honeymooned at The Majestic in 1940. We still have the receipt somewhere. Although the photos show the hotel rundown, you can still see the beauty and grandness. Now … gone. As a newcaster said last night, it is hard to say goodbye to a place that was part of our history. Yes, it feels as if a piece of us has died. So sad. We had our high school prom there in 1990 and it was a beautiful hotel. We took our prom pictures on the balcony. It's hard to imagine it in ruins. It's sad that no one wanted to save such a beautiful place, so much history gone. They say you cannot go home again. With Majestic now on fire, there is no reason to go home. Hot Springs has a way of disposing of its unwanted sights. Add this to the annals of the spectacular fires the city has had over the years. What a shame! Why did the city of Hot Springs allow this to happen to happen to such a fabulous landmark? We can only hope that somehow The Majstic Hotel will be returned to it's former glory! 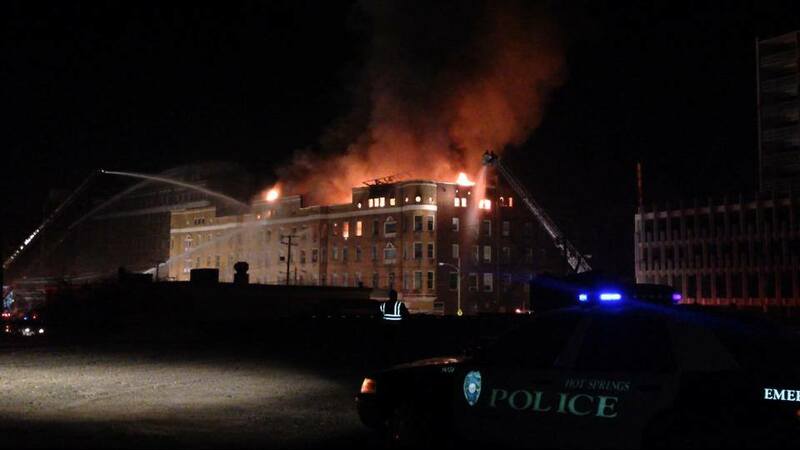 Channels KATV 7 & THV 11 Arkansas reports cam thru on my facebook page, tonight, The Majestic Hotel, Hot Springs, Arkansas on fire. I've been through recently and was heartbroken to see it in such disrepair. Even more heartbreaking, my girlfriend attends ASMSA across the street from the parking structure and tonight a fire has started on the roof. I'm not sure what extent it will go to but from what she's told me I'm afraid I don't have much hope of that beautiful place surviving. Such a shame that they couldn't renovate it and make it into apartments because of the huge price and also from what I heard people were very superstitious about it being haunted. Just saw where it is currently on fire. So sad. its a shame theyre letting this place rot from the inside out i pass it everyday and shake my head. Has anyone been in here recently? I've been wanting to take pictures in here for so long. How would one go about getting permission to take some pictures here? I have stayed at the Majestic several times, and it was my favorite hotel in the area. The history was palpable! It broke my heart to see it closed and now it pains me to see such a grand old lady passing away. My husband and our 2 kids stayed in July 1992. We got to stay in what they called the "Private Rooms" which, if I remember right, was the apartment that the maintenance man and his family would live in when "The Majestic" was in it's heyday. There were stained glass windows by the entrance way into the apartment and a balcony that over looked the pool. I can't remember how many bedrooms it had but it was a pretty nice, spacious apartment. What a shame to let something this wonderful and historical in a city with this much history, fall into disrepair. This is sad, and I know it would take a ton of money to bring it up to code- I lived in HS and lived in the old high school, downtown- they did a great job with the high school, turning it into apartments- I don't know how someone can close the doors and walk away from that property and how the city can let that place go to crap! It's a part of history and﻿ needs to be restored-some way, some how! The sad thing, Hot Springs has many buildings that are going to crap! I was a bell hop﻿ at majestic the summer after i graduated high school; it was a beautiful to watch families have precious vacation time with each other; no worries no pressure just love and ministering to each other. Because of new regs. Cannot use asbestos in any public buildings for health reasons. Too cost prohibitive to remove all of it. This is a crime. Hot Springs is still a happening place, so why doesn't someone with money step in and renovate a national treasure like the Majestic Hotel? They had the best spa in town, better than the Arlington in﻿ my opinion; and the rooms were still nice when I last stayed there in the 1990s for a very reasonable rate. Yeah i think that they should run a campaign to aware the community persons for taking part in renovation of the Hot Springs. Thanks for sharing. Incredible, lovingly crafted detail in this blog. York back in 2004, I returned to visit my family and I took my sister out for a girls' weekend at this hotel. I have some faded pictures of us in the room and at the spa. I look at them all the time and now I marvel at how quickly this place has deteriorated. Please, someone, save this swooning site! I appreciate what you're doing here! cheers! Hey Heather! Do you think you can email us a copy of this pictures? We would love to add them to the historical part of the post and give you credit of course! This breaks my heart. I have so many fond memories of family vacations to this hotel. I learned to swim in that swimming pool, as did my brother and cousins. I watched my grand parents get dressed up and dance here, and shared many malts with my gramps in the little ice cream shop. I can't believe what bad shape the building﻿ had gotten in. The Majestic will always have a very, very special place in my heart. Does anyone know if any of the fixtures or furnishings were saved? Does anyone know if it is being renovated or still sitting abandoned? Were you able to just walk in? I am going through town and would love to video a few shots inside for a project, but can't find the owners info and now I see you said they do not respond. Do you know what door is open? Thanks for any help. Hello…..just wanted to know how i could get a hold of someone who owns this….would love to RESTORE this entire hotel…if you know please let me know. The City currently owns it and is in the midst of a lawsuit to stop the destruction of the Red Brick Portion which is the remaining Historic Portion. They are currently tearing down the Lanai Towers and the back portion is already gone. I have a page and another lady with many many supporters on Facebook from all over Fighting to save Her. Please join us in our battle to preserve what is left of her. All are Welcome to join us and She needs u all. My page is an open Group: Save the Majestic. And I am Lisa Beeson Adair on Facebook, please look us up. We need you all. Thank you! You can try calling the Arlington Hotel at 501-623-777. At last count the company that owned the Majestic also owned the Arlington which is right down the road. They may be able to help you out. I drive by there every morning and it breaks my heart to see it in such disrepair. I have a few fond memories of going to prom there and always wanted to go back but never got the chance. 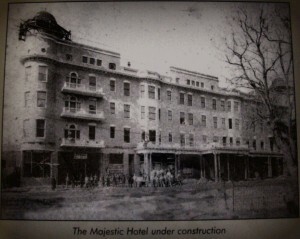 I have lived in Hot Springs my whole life and out of all the old hotels in downtown the Majestic was my favorite. It is placed at such a great spot. I know all articles have said that it declined because gambling was made illegal in the town but the Oaklawn race track has a casino so I'm sure this place could once again make some money. Hell I lived here and I want to go back to it. Southwest Hotels use to own it and supposedly sold it to The ARC Arkansas, a nonprofit organization that supports people with disabilities and their families. I'm not sure if that ever happened. But one article I read said this, "Investor-developer Garrison Hassenflu has been involved with the property since 2011." Maybe you can find this person and see what is going on. I can't imagine anything else being there or that space being empty. It is in the middle of downtown and it is seen by tourists every day. I drove by there and got the number off of the for sale sign. 501-520-4000 Let us know if you do start restoring it. It's sad it burned down. sad that they let it get in such bad shape makes me sad that so﻿ many of the historical places are being destroyed… its Our history thats being torn down! once they are gone their Gone! I grew up in this hotel with all the great employees as a child i would run the halls, and bother probably everyone who worked there.My mother managed the sundry store for many many years.At the age of 18 started working there in the bathhouse/spa.That Hotel is very special to me,i hate to see the conditions it has been left in.Fingers crossed to see this wonderful building up and running again one day, prays to the new owners.And Thank you so much for sharing this with everyone. Too bad the owners dont shore up the roof. The really old beige building is too far﻿ gone. This was﻿ Sad to see, a building so elegant shut down.. & due to gambling.. Yet, ok for the state to have Lottery's .. Loved the mural at 2.23 .. So sad. My store The Lagniappe Shoppe got its﻿ start in the Majestic in 1989. We stayed until it closed. Sad to see how fast it has deteriorated. I would love to see the Majestic restored and put into use as some of the other historic buildings in Hot springs have been. Thanks for your site, I really enjoy it. Yes! Haha! I use WordPress, and everything was pretty much hand coded. Thank you for your comment! I love hearing feedback, and if you want to send me a private message, I can give you some more detail!